Asia Pacific Waterproofing Membrane Market size was above USD 1.4 billion in 2016 and expects to surpass 800 million square meters by 2024. Positive outlook towards using durable and reliable construction materials should drive Asia Pacific waterproofing membrane market size. Favorable regulations towards green construction owing to environmental concerns in APAC region and government initiatives is likely to bolster regional product demand growth. Thailand, Japan, India and China are increasingly spending on infrastructure development which should have positive impact in industry growth. China construction industry surpassed USD 1.75 trillion in 2016 and is considered to witness significant growth during the forecast timeframe propelling regional waterproofing membrane demand. Construction spending in India accounts over 10% of the Asia Pacific region and should increase during forecast timeframe. Availability of raw material coupled with technological innovation which imparts properties like flexibility and UV resistance may fuel product demand. Some materials used for the production process include PVC, polyurethane, thermoplastic polyolefin and EPDM. These products are applied on porous surfaces and prevent leakage through seams or substrate offering full surface adhesion, flexibility and vapor permeability. According to 12th Five Year Plan of China, government announced to construct around 56 airports and expand another 16 with an estimated investment of over USD 65 billion which should contribute towards waterproofing membrane demand. Increased investments in R&D along with technological innovation should enhance product portfolio and cost-efficient production. Fluctuation in crude oil price index can affect waterproofing membrane market price trend as the products are derived from petrochemical based raw materials. Other factors affecting production include refinery economics, inventory and competition. Bitumen is most widely used material in production owing to global overproduction capacity and adequate supply. Waterproofing membranes are based on two types, sheet membrane and liquid membrane. Some major application segment for these products include roof, car park deck, terrace, landfill & tunnel, pool and basement. Polymer modified cement waterproofing membrane market size in Asia Pacific expects to surpass USD 700 million by 2024. It helps in saving energy, reduce environment pollution and readily available in the market with easy mix & apply characteristic. This product is mostly used in applications which include wet area, wall, deck & terrace, car park deck and roof. Asia Pacific thermoplastic polyolefin roofing membrane market expects gains at over 8.5 %. Key characteristics include high energy efficiency, heat reflectivity and resistance to ozone & chemical exposure. They are majorly used in applications which include basement, landfill & tunnel, pool and garden roof. 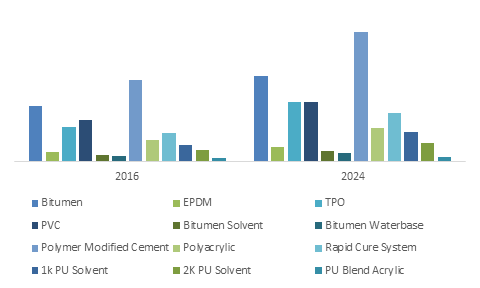 PU solvent waterproofing membranes market size in Asia Pacific expects significant gains and are majorly used in wall systems owing to its ease of application and uniformity. Rise in infrastructural spending due to rapid urbanization and population growth might favor product demand. 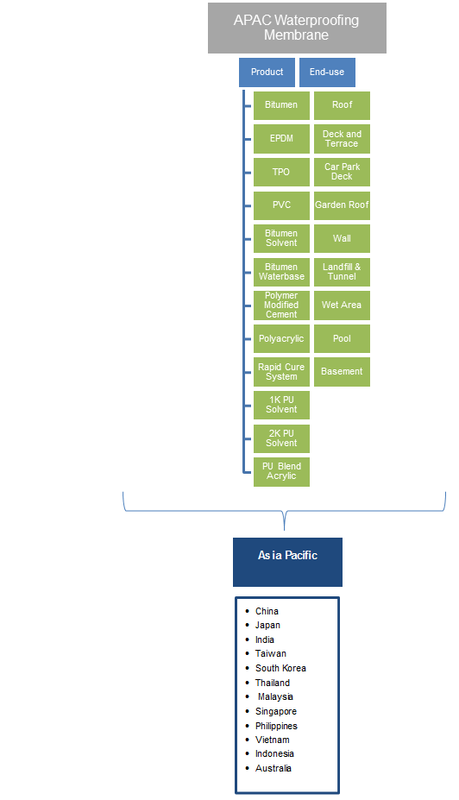 Asia Pacific waterproofing membranes market size from deck & terrace applications expects to surpass USD 450 million by 2024. Bitumen based products are widely used in deck & terrace designing due to its fire redundancy and performance at extreme temperature along with high resistance quality. Asia Pacific Waterproofing membrane market size from wet areas expects gains at over 8.5%. Wet areas in buildings include spaces like bathroom & kitchen are reputable of being in direct contact with water & requires system under the tilling to protect the concrete and prevent any leakage. Polymer modified cement, polyacrylic membrane and PU systems are majorly used systems applied in wet area. China waterproofing membrane market size expects to surpass USD 1.35 billion by 2024. According to China building code, wet areas such as kitchens, drainage pipes, septic tanks and bathrooms should have assured measures for leakage prevention with efficient drainage systems. Bituminous and EPDM based products is widely used in roof applications in China owing to good resistance to weathering abrasion and UV rays along with durability & availability. India waterproofing membrane market size expects gains at over 10% by 2024. The growth can be attributed to growing need for rehabilitation and renovation projects for ageing & deteriorating infrastructure. Positive outlook towards growth in construction spending for building public infrastructures such as dams, institutions and manufacturing units should promote product demand. Favorable BIS standards pertaining to use of bitumen felt and primer and companies providing range of APP or SBS modified bitumen based membrane for building roofs and basement for treating blisters should promote product demand. Japan waterproofing membrane market size is projected to surpass over USD 400 million by 2024. Supporting regulatory norms pertaining to providing high quality building and infrastructure to ensure high building lifespan has led to rise in product demand. Consumer adoption of green roofs owing to environmental concerns supported by rising economic standards and availability of efficient architectures and designers is likely to stimulate product demand. Asia Pacific waterproofing membrane market share is moderately fragmented and some of the industry players include Sika AG, Dow Chemical, Covestro, BASF SE, Ardex, Mapei, Tremco, Samhwa Paints, KCC Corporation, Maris Polymer and Fosroc. Industry participants emphasize on mergers & acquisitions and product innovations. In April 2016, ARDEX introduced two new bituminous membranes in its product portfolio. ARDEX WPM 117 is a self-adhesive bituminous membrane and ARDEX WPM 444 is an Atactic polypropylene plastomeric type modified bituminous membrane. Waterproofing membranes are thin layer of water tight sheath laid over a surface restricting water to pass through it. It comprises of waterproof plastics, rubber and coated fabric material and has wide application outlook on walls, roofs, basement and deck in construction industry. It is produced in mostly two forms of sheet and liquid based membrane, where liquid based membranes are usually sprayed or applied by brush over the surface and sheet based membranes are usually applied and joined using hot tar based adhesive.